In her push to find money to improve New Orleans’ decrepit infrastructure, Mayor LaToya Cantrell is targeting a share of the $160 million in sales and hotel taxes that are collected each year to promote the tourism industry. The bulk of that money comes from a tax on hotel guests in New Orleans that goes to four tourism-related entities, although a portion also comes from a separate sales tax on food and beverage purchases at New Orleans restaurants and bars that goes directly to the Ernest N. Morial Convention Center. Since October, Cantrell has been saying that the Sewerage & Water Board needs a chunk of that money every year to maintain and replace rickety equipment and to invest in projects to prevent flooding during major rainstorms. Making the city better able to avoid flooding and boil-water advisories will make New Orleans more attractive to tourists, not to mention its residents, Cantrell has said. The tourism industry has resisted her effort, with industry leaders saying that all of the money they receive now is already obligated for current and future spending needs. Cantrell has targeted four entities: the Convention Center; the Louisiana Stadium and Exposition District, popularly known as the Superdome Commission; New Orleans & Co., the city’s main convention and tourism promotion agency; and the New Orleans Tourism Marketing Corp. But the Morial Convention Center is the most inviting target for such a raid. The state-owned entity has been collecting so much money in recent years that it is sitting on a whopping $235 million in reserves, although the center’s general manager says all that money is committed to current and future projects. The center’s annual operating budget is $52 million. In recent years, Convention Center officials have been doling out money with little public scrutiny for everything from a $250,000 annual subsidy for the London-New Orleans flight offered by British Airways to a one-time $9 million payment to help the Audubon Nature Commission acquire the Gov. Nicholls and Esplanade Avenue wharves, as part of a land swap involving the Port of New Orleans. Morial Center officials are also planning to give a $67 million subsidy to private developers to build a 1,200-room hotel at the upriver end of their facility. That plan also calls for allowing the developers to avoid tens of millions of dollars in taxes — a proposal Cantrell and others have criticized as a massive giveaway. The state board that runs the center also has been spending millions of dollars in recent years to help underwrite projects important to the city, including money for State Police troopers patrolling the French Quarter, for New Orleans Police Department anti-crime initiatives and for a new homeless shelter championed by the mayor. Cantrell doesn’t have much leverage to force more dollars out of the tourism-related entities because she has no say over the distribution of the hotel tax and the sales tax for the Convention Center. The state Legislature authorized both taxes, and it would be up to legislators to redirect those funds. Gov. John Bel Edwards and Louisiana’s most powerful lawmaker, state Senate President John Alario, R-Westwego, have both rejected Cantrell’s notion that some of the money should be shared with the city. “All of that is seed money to bring visitors to our city,” Alario said in an interview. He added that he has had good private meetings with the mayor recently at her initiative, including a dinner at Mosca’s on the west bank and lunch at the Bon Ton Cafe in New Orleans. The tourism industry needs all of the tax dollars it receives, said Stephen Perry, president and chief executive officer of New Orleans & Co., which gets its funding from some of the same taxes. “To run a billion-dollar building — this applies to both the Dome and the Convention Center — you are constantly reinvesting in the facilities to keep them competitive in the marketplace,” Perry said. Perry caused waves last week when he told The Lens that city leaders have shown they can’t be trusted to spend more tourist dollars wisely, given New Orleans’ myriad problems. Still, tourism leaders have tried to avoid a major political battle with Cantrell by offering to reinstate a 0.55 percent sales tax on hotel rooms that just expired. It would provide $6.7 million a year to the city. Cantrell said that isn’t enough for a city that needs an estimated $81 million per year to upgrade its water and drainage systems. The Sewerage & Water Board would like to spend $166 million this year on infrastructure projects, according to its budget. Exactly how the mayor will create such a source of sustainable funding is not clear. “All options are still on the table for us,” Pourciau said when pressed for specifics. The biggest target for the mayor is a 14.6 percent sales tax on hotel guests, which is effectively 16.35 percent because most hotels assess an additional 1.75 percent tax. 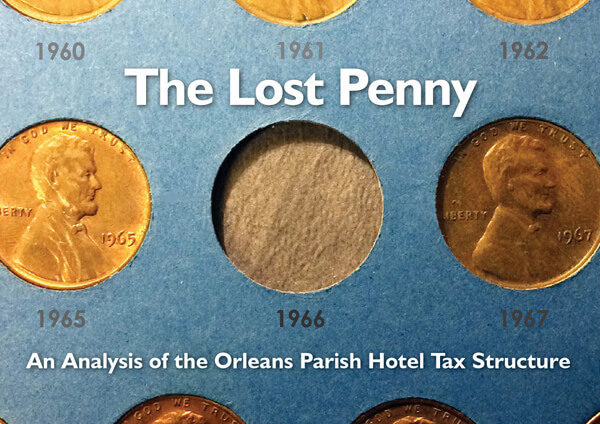 In 2019, the hotel taxes will generate about $200 million, according to the watchdog Bureau of Governmental Research, which is about to release a report on Orleans Parish hotel taxes. About $145 million of the $200 million will go to the Convention Center, the Superdome Commission, New Orleans & Co. and the Tourism Marketing Corp. The other $55 million will be divided among the city, the Orleans Parish School Board and the Regional Transit Authority. The Superdome Commission receives the biggest share of the hotel tax, about $60 million this year. The commission provides the money to maintain and renovate not only the Dome itself, but also the adjoining Smoothie King Center, Champions Square, the TPC golf course in Avondale, the stadium that houses the Baby Cakes minor league baseball team in Metairie and the Alario Center in Westwego. Doug Thornton, who oversees the Superdome for SMG, a private company that manages the facility, said that as a New Orleanian he sympathizes with Cantrell’s demand. But he said the Superdome Commission has no spare cash. He said the entity typically runs a surplus of $2 million to $8 million per year, but it then reinvests that money on routine maintenance and minor upgrades. In the meantime, Superdome officials want to find $350 million to $450 million to once again undertake a major renovation of the facility, which they say is necessary to keep the Saints as well as to bid for future Super Bowls and Final Four basketball tournaments. New Orleans & Co., formerly called the New Orleans Convention and Visitors Bureau, receives $20 million per year from the hotel tax, plus money from other sources. The group promotes New Orleans to domestic and international tourist groups and conventions and sends a portion of its revenue to other entities, including the New Orleans Tourism Marketing Corp.
That entity advertises New Orleans particularly to domestic leisure travelers. Mark Romig, its president and chief executive officer, warned against taking away any of its money. “If we’re not out in front of the visitor with our messaging, other destinations will fill that void, and the visitor will go elsewhere,” he said. Unlike the other three organizations, the Morial Convention Center also receives money from a separate 0.75 percent sales tax on food and beverages sold at New Orleans restaurants, bars and other “food service establishments.” The hotel tax provides $50 million per year to the center, while the food and beverage tax provides another $15 million. The Convention Center’s reserves dwarf those of the other tourism-related entities — its reserves are an extraordinary 451 percent of its annual operating expenditures — because it has been socking away collections from these taxes since 2002 to finance what was once planned as a so-called Phase IV expansion. Officials scrapped plans for the expansion shortly after Hurricane Katrina, but the money has continued to flow into the facility’s coffers. That has led to the $235 million reserve fund balance as of Sept. 30, according to Michael Sawaya, the Convention Center’s general manager. But in an email, he said that all $235 million is obligated: $75 million for the building’s operating costs, $15 million for smaller building upgrades, $45 million for debt and contingency costs, and $100 million for the ongoing reconfiguration of Convention Center Boulevard and the planned hotel. “There are no surplus funds,” Sawaya said. Holding onto so much money, however, has turned the Convention Center into something of a piggy bank for local projects that are deemed worthy but lack funding. $1 million per year to help finance the state troopers in the French Quarter, or a total of $5 million over five years. $12 million to purchase the buildings that house the new New Orleans Culinary and Hospitality Institute near Lee Circle. $23 million to help finance the narrowing of Convention Center Boulevard to make it more pedestrian-friendly. That sum includes $7.5 million to renovate Spanish Plaza at the foot of Poydras and Canal streets. $1.25 million over five years for the “low-barrier” homeless shelter that the city has opened on Gravier Street. $295,000 to cover half the cost of a program called “We’re Jazzed to Have You” that paid for an airport billboard and baggage claim signs and for bands, police details and beads for visitors. $2.25 million as part of an agreement by state and local governments to pay British Airways up to $9 million over four years for establishing its New Orleans-London flights. $9 million to help the Audubon Nature Commission buy the Gov. Nicholls and Esplanade Avenue wharves for planned conversion to a public park. $23 million to install video cameras in and near the French Quarter and to create a central command center where staffers monitor the anti-crime cameras around the clock. Providing money for these projects “shows our desire to be partners with the city of New Orleans,” Sawaya said. But he said the Convention Center is phasing them out because of a need to focus on its direct priorities.